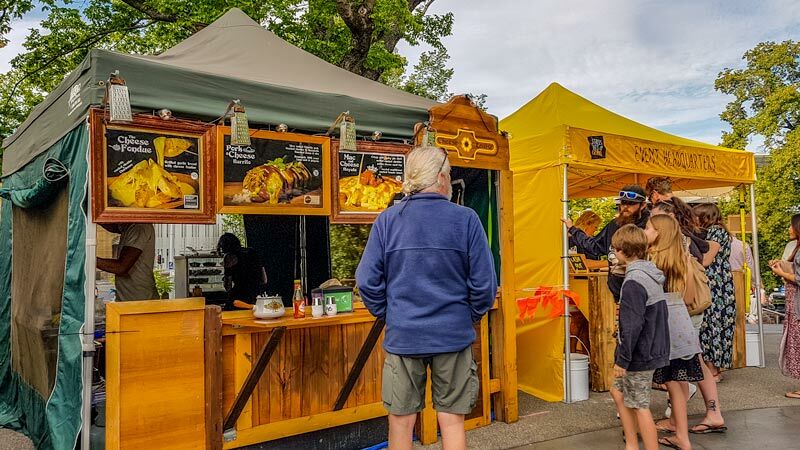 Tasmania is a paradise for foodies and what better way to immerse yourself in that than to visit the markets frequented by the regions producers, farmers and locals. 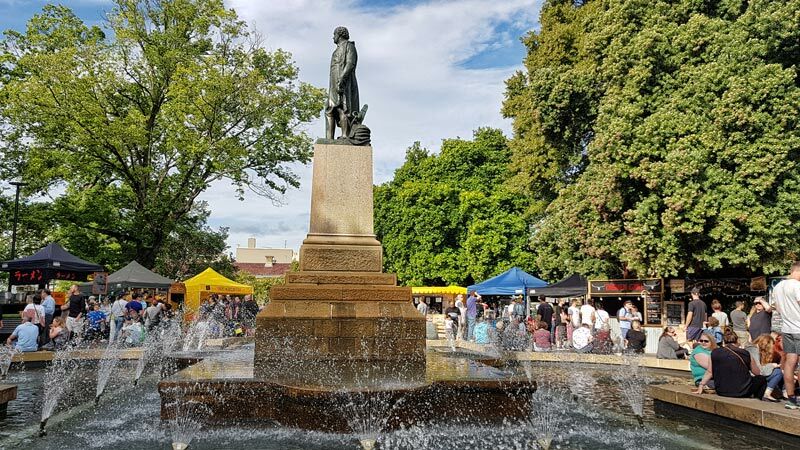 These 3 best Hobart markets provide plenty of opportunities to taste and purchase local ingredients and feast on delicious ready to eat treats. As I got underway planning our first trip to Hobart in Tasmania I knew that food was going to play a huge part. Tasmania is known for having some of the cleanest air in the world, a bounty of seafood, innovative and skilled artisan producers and a diverse array of growers and farmers. 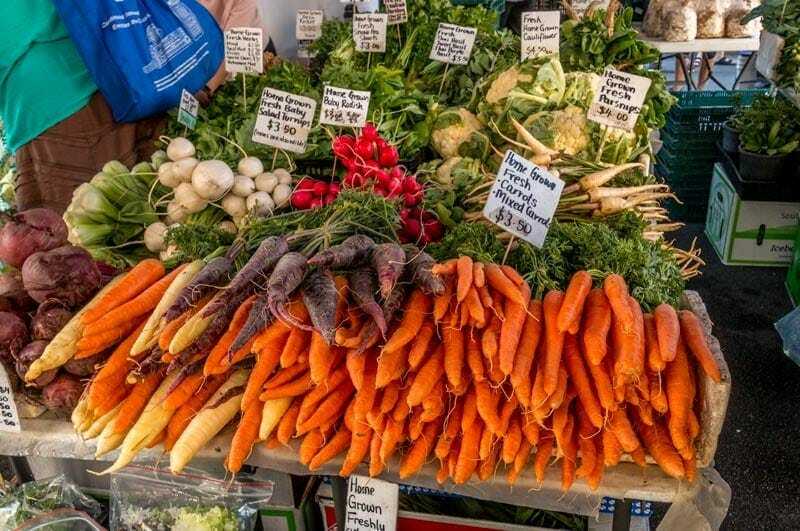 One of the best ways to seek out these foods and to learn the stories behind the produce is to head out in search of the best farmers and foodie markets. There are a number around in the greater Hobart area, plus as you drive around you’re going to find plenty of farm gate sales and honesty boxes to satisfy your cravings for fresh produce, we were lucky enough to be there during berry, cherry and stone fruit season – delicious! 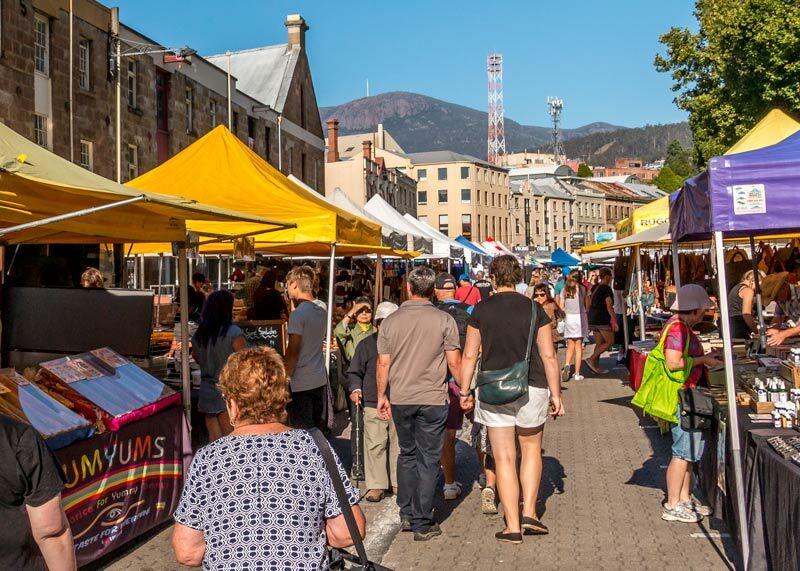 The best known market in Tasmania and the largest with up to 300 stall holders setting up each weekend is Salamanca market. This market sets up between the historic sandstone warehouses on Salamanca Place and the boats moored at the waterfront piers. Several parks including Parliament House Gardens, Tasman Memorial and St David Park are adjacent to the action. They provide a rest stop, a space to watch the market action, chill out under the shade of an old tree and enjoy your drink and snacks of choice for the morning. I was pleased we always pack a light Turkish towel to use as a picnic rug when we’re travelling as there were no tables or seating which might be a challenge for older visitors or at times of the year when the ground is cold and wet. The location really is something special. 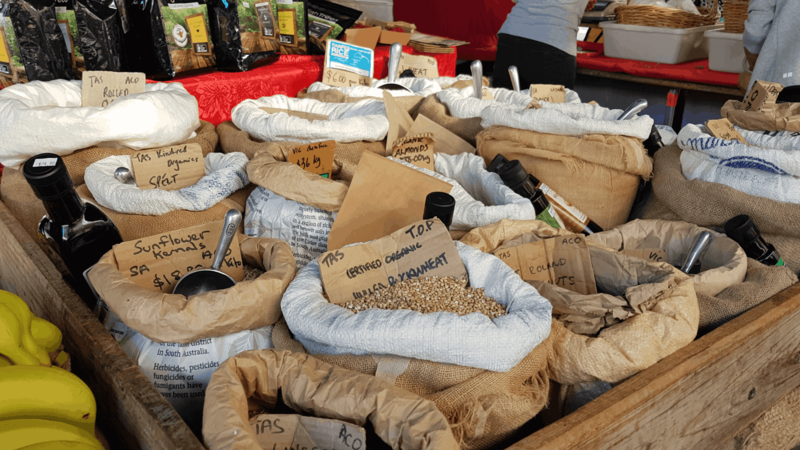 The markets themselves provide a venue to local producers and growers but for the foodie first market goer a large number of the stalls are selling art, craft, trinkets and clothing. With so much on display I have to admit we did skip past a number of stalls, although it was overall locally made and excellent quality we just don’t need more stuff. The stores that were selling fresh produce were wonderfully fresh and good quality, the colours were so enticing and it was very difficult to resist the temptation of some of the different vegetables that aren’t so widely available in the tropical and sub-tropical parts of the country. I was also totally taken with the idea of being able to buy organic and GMO free lentil, seeds and other dried goods in quantities to suit. I saw a couple of local ladies with their reusable cloth bags stocking up on these and thought what a great idea they were. 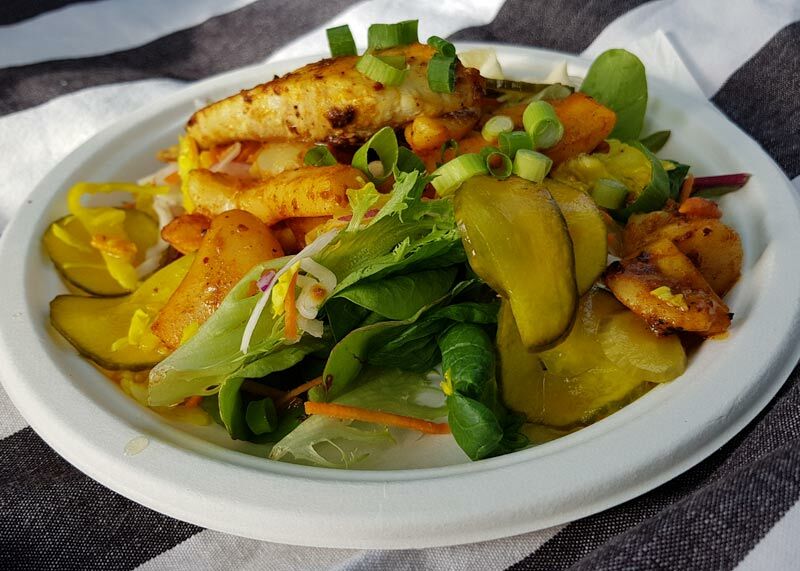 It’s an undeniably popular market, we were there slightly before the opening time and by the time we left and headed to the park with our tasty treats it we really buzzing, I can only imagine how busy it would be if there was a cruise ship parked down at Constitution dock. I’d also note here that the Salamanca area itself is lovely, we’d recommend coming down here for a look around the galleries and specialty stores and to visit the restaurants and bars on another day when you can do it without the crowds, it’s a whole different experience. 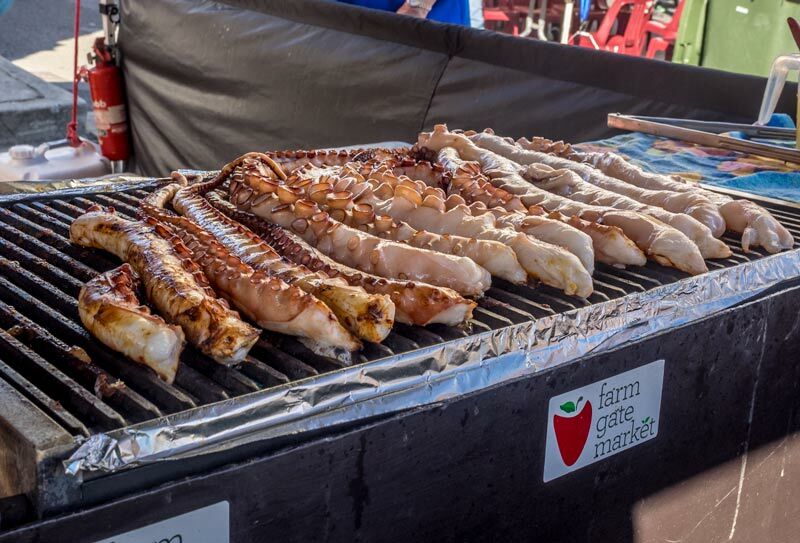 For the locavore and foodie the Farm Gate Market is the real deal. What better way to ease yourself into Sunday than loading up on farm fresh produce for the week , grabbing a seat at a communal table to listen to the soothing sounds of the saxaphone and sampling all the local produce, in this case freshly grilled Tasmanian octopus tentacle with an ouzo shooter. Well yes you can have some of those delicious looking freshly baked pastries with hand made jam instead if you prefer but they make a fine second breakfast too. 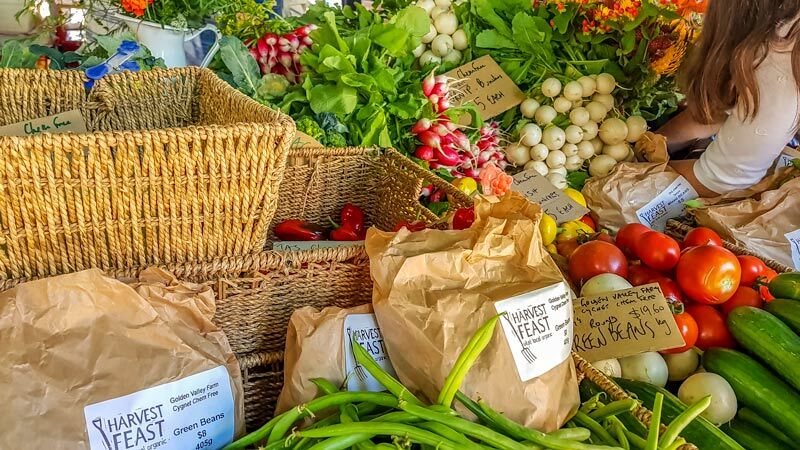 The Farm Gate market has been running in Hobart for around 7 years now and is simply and exclusively for the foodie, you won’t find clothes, arts and crafts and a random assortment of goods here, to claim your space in the market your produce MUST be eaten, drunk or grown. It’s even more authentic as you must also be the producer, there are no re-sellers here! Whether you’re buying a wedge of cheese cut fresh from the wheel or trying out a new vegetable you’re talking to the artisan producer or grower, who better to tap for the very best tips on preparation and serving suggestions. 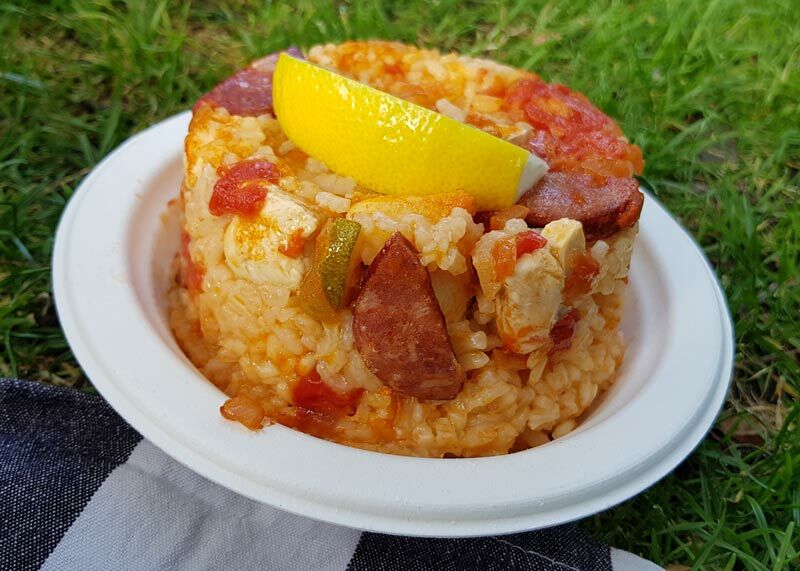 For a foodie market experience of a slightly different kind we headed to Street Eats @ Franko on Friday evening after a busy day exploring Port Arthur from land and water. 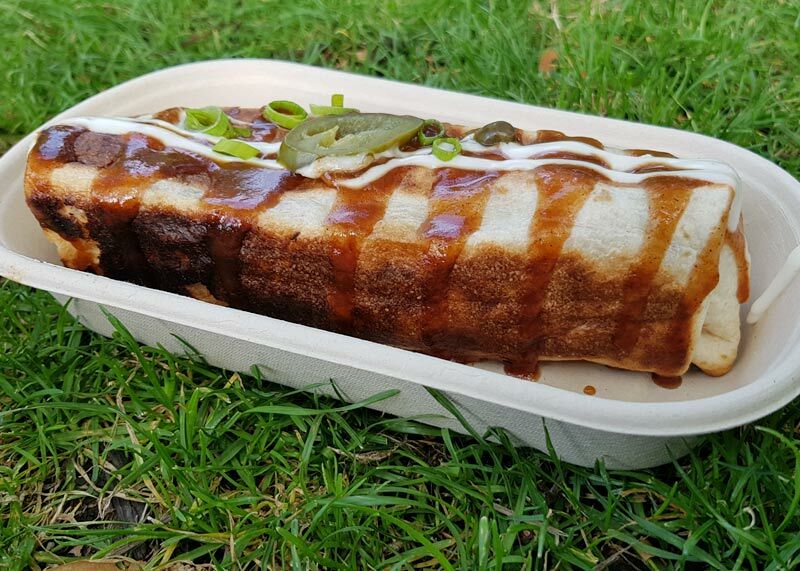 This one isn’t about stocking up on the produce for the home gourmet, it’s a street food and food truck gathering point with a difference. Franko refers to Franklin Square, a community space and park near the waterfront in the Hobart CDB. On a Friday night this is the place to be for locals and visitors to mingle, relax, listen to some great live music and indulge in some of the fantastic local Hobart foods. Street Eats @ Franko is a true local Tassie experience, if it’s not from Tasmania you’re not going to find it here. 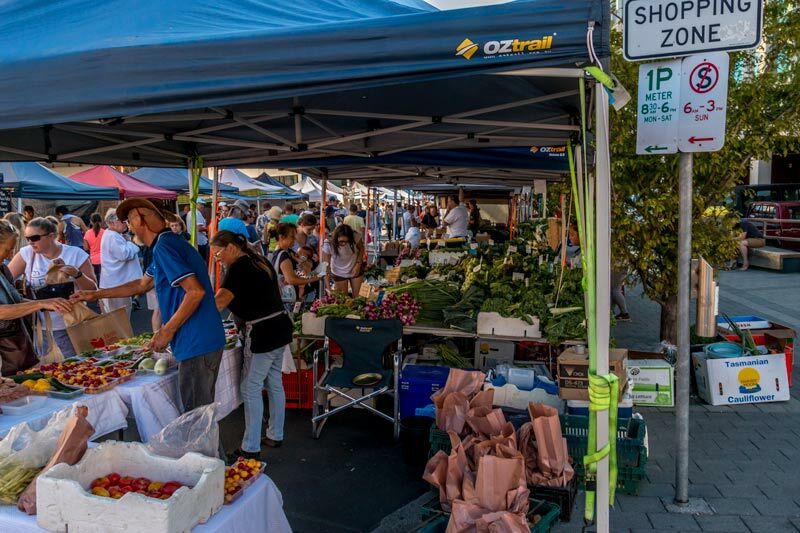 This market experience is from the same creators as Sundays Farm Gate market and you might see a couple of the locals pop up in both from week to week. Try to get there early, we plan to arrive around opening time for the best selection of produce and the chance to chat to the stall holders about the product before they get too busy. Make sure you have cash and as close to the correct change as possible for all those little purchases as you wander through. Unlike my plan for supermarket shopping where I always make sure I eat first, I’d suggest heading to the markets when you are HUNGRY. You’re going to want to have the appetite for all those little testers and the ready to eat treats. Take a market bag or two. It’ll make it easy to tote around those souvenirs and treats for later and not using disposable plastic helps keep Tasmania so beautifully clean and green. If you’ll only be in town for a few days I’d highly recommend the weekend, it’s when all the market action happens down here. If the timing doesn’t work for you and you’re after a locavore foodie experience mid week we’d highly recommend heading over to Bruny Island, it’s a gourmet paradise. Looking for more tips on visiting Hobart? 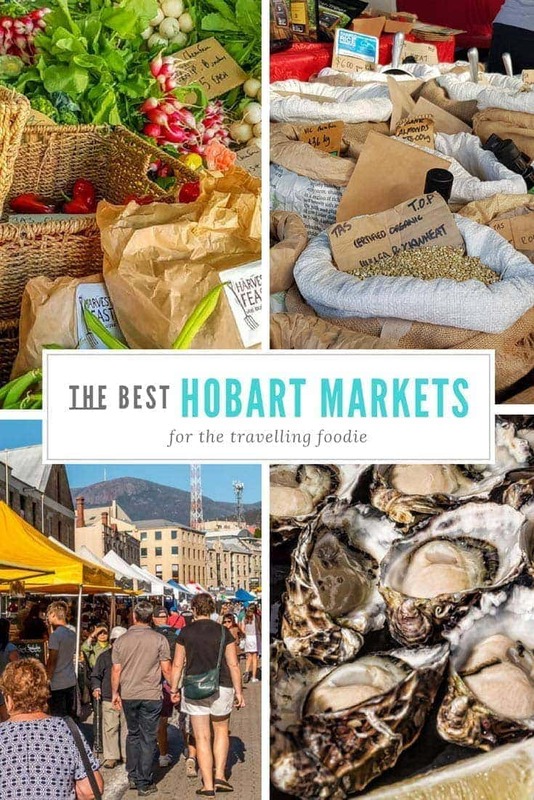 Check out our Hobart travel guide. We were in Tassie recently and only managed to get to Salamanca… You’re making me want to go back! Yum! Markets are always one of the first things I try to find when I’m travelling to a new place. I’m heading to Tasmania later this year, so thanks for the heads-up!